Westinghouse has announced that it is partnering with the Nuclear Advanced Manufacturing Research Centre (Nuclear AMRC) and Cammel Laird on an additional advanced manufacturing study to explore potential design efficiencies to reduce significantly the build lead-times of the Westinghouse Small Modular Reactor (SMR). These efficiencies can provide important reductions in costs to customers while promoting growth in manufacturing within the UK, an important part of Westinghouse’s SMR program. 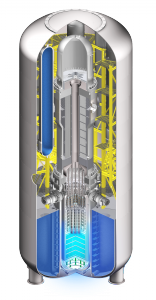 Earlier this year Nuclear AMRC conducted its first advanced manufacturing research study on the Westinghouse SMR’s Reactor Pressure Vessel (RPV), one of the largest and most demanding parts of any reactor. The study concluded that Westinghouse’s design had the potential to be efficiently manufactured in the UK, a significant growth market for Westinghouse. For the latest advanced manufacturing study, alongside Nuclear AMRC, Westinghouse has also partnered with Cammell Laird. “Cammell Laird has over forty years’ experience in the design, manufacture, assembly and transport of large complex modules to a number of safety critical sectors. We are pleased to bring this knowledge to support the Nuclear AMRC in undertaking the Nuclear Module study for Westinghouse,” said Jonathan Brown, Managing Director, Cammell Laird. Westinghouse says that this announcement further demonstrates its commitment to partnering with the UK Government to deploy the company’s SMR technology in order to move the UK from buyer to global provider of the latest nuclear energy technology. Westinghouse has a strong UK presence and has also met the requirements necessary to manufacture fuel for the Westinghouse SMR in the UK.